INDIAN WELLS, Calif. – Juan Martin del Potro rallied from three match points down in the third set and beat top-ranked Roger Federer 6-4, 6-7 (8), 7-6 (2) to win the BNP Paribas Open, handing the Swiss superstar his first loss of the year. 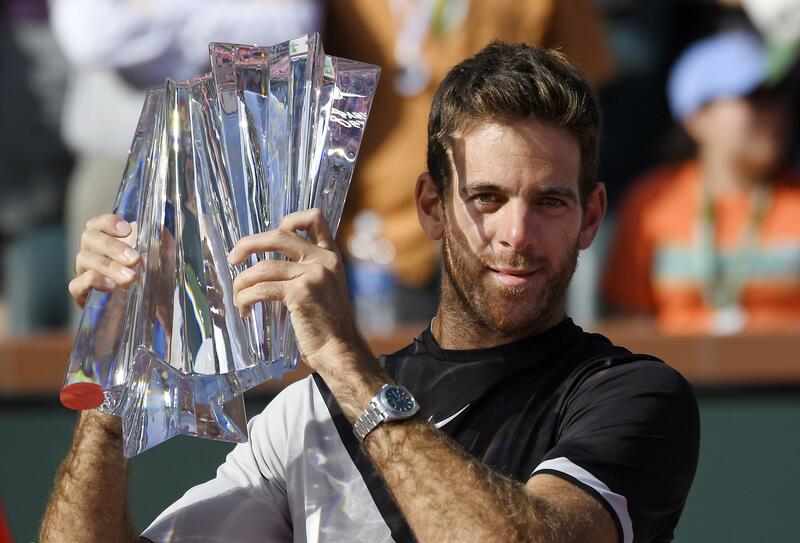 Del Potro became the first Argentine winner in the 42-year history of the desert tournament. Federer’s 17-match winning streak – the best start of his career – ended. Del Potro held a match point at 8-7 in the second-set tiebreaker, but he lost the final three points on his own errors that allowed Federer to force a third set. “I feel frustrated that I let an opportunity like this go by,” Federer said. They were on serve in the third until Federer broke for a 5-4 lead with a backhand winner off del Potro’s serve. Federer had a chance to serve out the match, holding two match points. But del Potro staved both off to force deuce. Federer’s forehand went long, giving del Potro a break point. Federer answered with a backhand that hit del Potro at the net and then gained his third match point on del Potro’s forehand error. Del Potro recovered to deuce with a forehand winner. Federer mis-hit a forehand high into the air beyond the baseline, giving del Potro another break point. The Argentine cashed in with a well-placed forehand in the corner to tie the set, 5-all. In the tiebreaker, Del Potro raced to a 6-1 lead, helped by two of Federer’s double faults. He closed out the win on his third match point when Federer’s forehand failed. “I would like to play that tiebreaker again because I don’t know what the hell happened,” Federer said. Del Potro lost just six points on his serve in the first set. In the second-set tiebreaker, Del Potro and Federer took turns arguing with chair umpire Fergus Murphy. Del Potro was annoyed the crowd was making noise on his serve and told the umpire he wasn’t warning them enough to be quiet. Del Potro survived three-setters against countryman Leonardo Mayer in the fourth round and Philipp Kohlschreiber in the quarterfinals. It was his first win against Federer since last year’s U.S. Open quarters. Del Potro trails in their series 18-7. Del Potro arrived at Indian Wells having won a title in Acapulco and back in the top 10 rankings. He nearly quit the sport after enduring four wrist surgeries in recent years. Naomi Osaka of Japan won the women’s title 6-3, 6-2 over Russian Daria Kasatkina. Published: March 18, 2018, 5:35 p.m.